Celebrity chef, Wolfgang Puck, has hit an absolute home run with his Spago, Beverly Hills, restaurant. One of the iconic Los Angeles restaurants, Spago is one of the great stops for the most discerning foodie. Executive chef, Lee Hefter oversees the food while the stunning wine program is just as enticing, with everything on the menu from cult Champagne to decadent first growth Bordeauxs. The quality of the restaurant's interior is really stunning, as was the service throughout the night. Initially we were seated near a cackling group and asked to be seated closer towards the kitchen in a corner, which staff easily obliged. We started our meal with one of the great Champagnes of the world, the 2006 Dom Perignon Champagne (WWB, 95), which seemed appropriate for the occasion. While we gathered our thoughts through this stunning menu, we noticed the roasted duck, which looked rather decadent. We were served some really tasty Mediterranean themed sauces for our bread, with some pretty extensive selections, followed by succulent Kusshi oysters. This was followed with a spring themed pea soup, which was surprisingly tasty. We had to try a few pasta dishes and very much enjoyed the squid ink carganelli pasta, with an incredible lobster reduction. The freshness of the pasta and lobster flavors were a stunning combination. 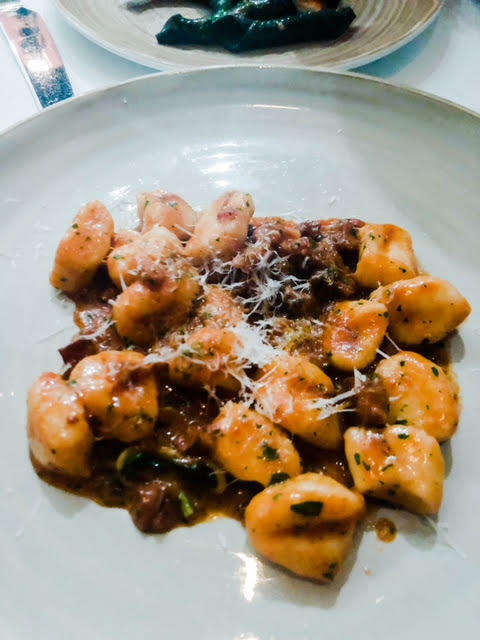 Our next course was exceedingly rich, homemade gnocchi with a lamb ragu. This paired much better with our red wine selection, the 2015 Quilceda Creek ‘Galitzen Vineyard’ Cabernet Sauvignon (WWB, 95). The Quilceda Creek at this stage is drinking marvelously and is actually taking on some more feminine notes of red fruits, which is surprising considering the heat of the vintage in Washington. The wine itself was a show stopper, drinking marvelously straight out of the gate and displaying a Bordelaise character that older Quilceda bottlings sometimes take on. While not the best pairing for the red wine, I finished my meal with crispy scale black bass, and fortunately I had plenty of Champagne left to compliment this marvelous dish that truly completed this memorable meal. We even left some room for dessert, compliments of the chef, Kardinal Schnitte, which is a rich Austrian cake with gobs of cream. My girlfriend found this particularly enticing. It served as the perfect ending to a very memorable meal of awesome service and even better cuisine.